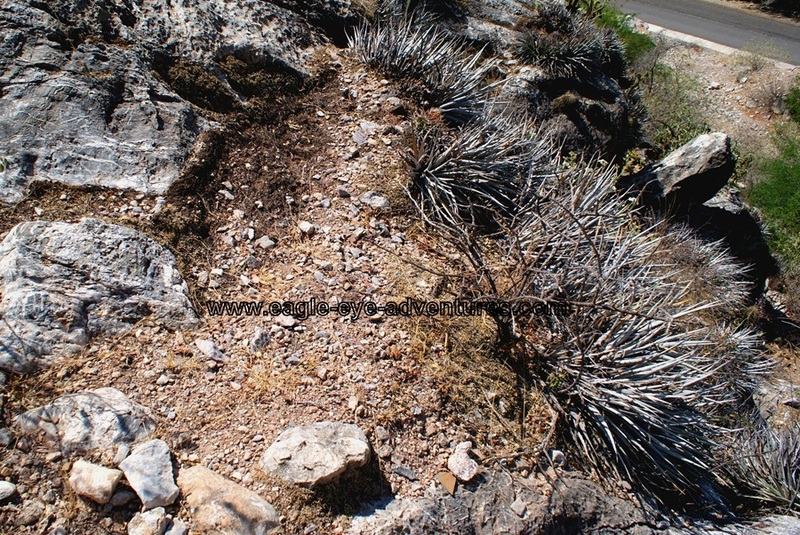 Hechtia zamudioi has a unique way of growing in a tough, dry climate. It like to grow on or between the limestone rocks in the Rio Estorax drainage. When a seed is lucky enough to find a crevice that is just in the right spot and get established, it will slowly grow into a large group of rosettes. Climbing around and observing these plants was pretty cool. 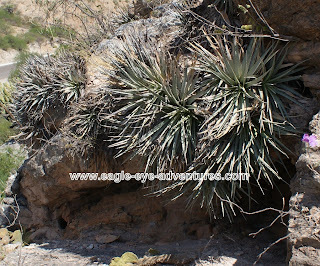 It was quite interesting to see how different the plants looked when viewing them from above than from below. Viewed from below the plants have a nice, almost pom-pom like form. Displaying both a nice symmetry and an appealing visual texture. However from above you get a much more instructive view of how the plants live. Life must be tough in such an extreme environment. The hot, dry sun bakes down from above. Having the bulk of the plants hanging down might be a great advantage. 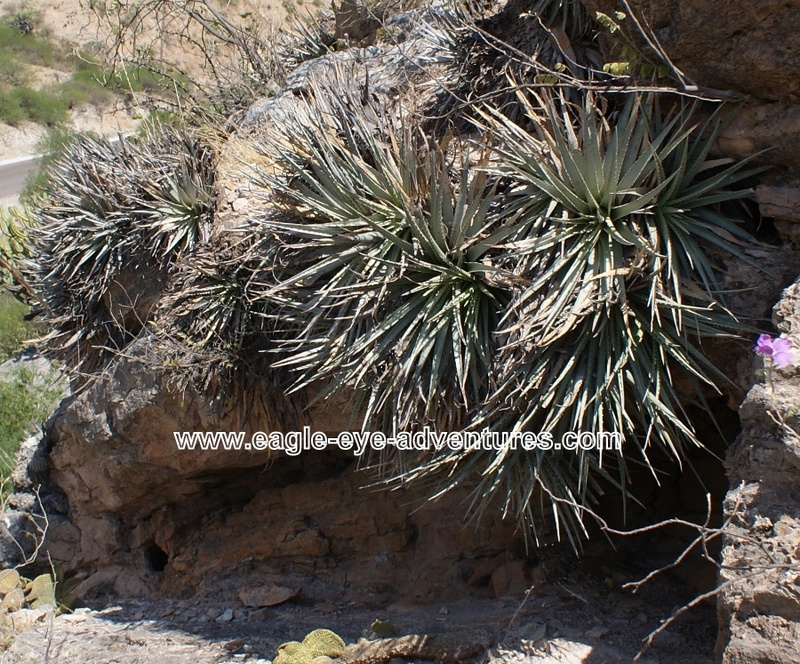 It may be difficult to recognize these beautiful plants when viewed from above like in the picture above. Below you can start to see the plants a little better from an angle. Notice how much dirt has collected behind the plants. 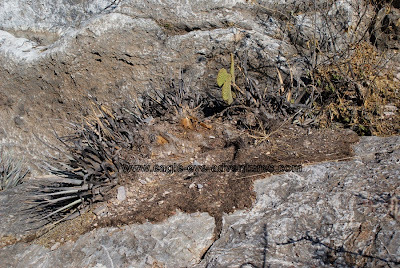 As they grow and spread out off the edge of the rocks, they are effectively collecting their own 'pot of soil' for themselves. It was interesting to see how many different plants then colonized this pocket of soil created by these Hechtias. Several species of cacti, small shrubs, and even two other species of Hechtia (H. podantha and H. lepidophylla) all take advantage of this niche. I have seen some other species which grow on vertical cliffs that will catch leaf duff and other organic matter to create their own pocket of soil, but nothing on the scale of these great plants!